Hey everyone, I felt it was time for some pink again! 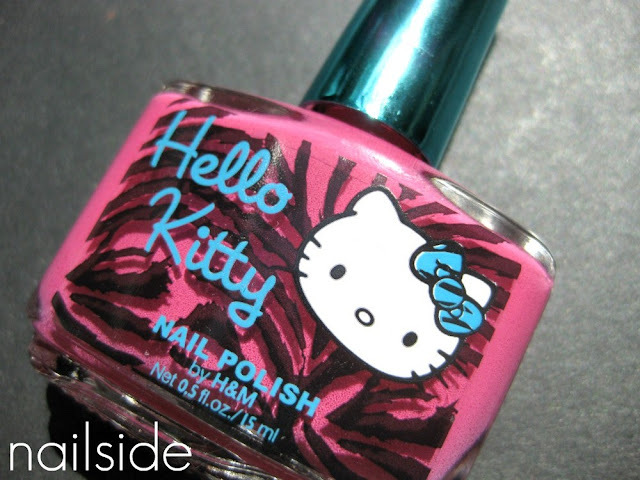 For today I have a new Hello Kitty polish from H&M called Pink Summer. I have to admit I only bought this because of the extremely awesome bottle (see the last picture), I probably already have something similar in my stash, but I don't feel any regret buying it. Not only is the packaging pleasant to the eyes, the polish itself is really nice too. It's very pigmented, even almost a one-coater. But I did two for complete opacity. Another big plus was the drying time, it dries to the touch in several minutes. So despite that it's not the most unique color, I am loving it. It makes my nails look like a Barbie's and I have nothing against that :) Thanks for stopping by! oh my god they better have hello kitty polish at h&m in montreal and toronto. i won't even care what color it is. haha! that's a gorgeous polish and cute bottle!